The fastest-growing segment of the American population consists of individuals aged 60 and older. In 1994, one out of every eight individuals in our country was over 65 years old. By the year 2020 it is estimated that one out of every six people will be over 65 years old. Approximately 20 percent of people aged 65 years or older have diabetes, and just about half of those people don’t even know that they have it! Another 20 percent of people over the age of 65 have impaired glucose tolerance. That adds up to a full 40 percent of our senior citizens with some degree of glucose intolerance! That statistic is not matched the world over. Some societies report diabetes prevalence as low as 3.5 percent in their senior populations. Advancing age is a risk factor for developing diabetes, but having 65 candles on the cake doesn’t make diabetes an inevitability. Prevention and treatment strategies boil down to accessing health care and implementing self-care. 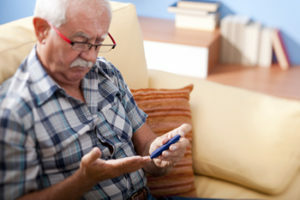 Many individuals have had diabetes for several years before finding out about it. That’s why it’s so important to have a thorough exam at the time of diagnosis. A dilated eye exam by an ophthalmologist. A urine microalbumin to assess kidney health. A complete foot exam to assess for nerve damage and circulatory problems. Assessment for the presence or risk of heart disease (heart disease is the most common disease present in senior citizens). A referral to a registered dietitian for meal planning. A visit with a nurse educator to teach blood glucose monitoring. Diabetes tune-up visits should be scheduled as necessary to achieve glycemic goals. Other diabetes education visits, and labs should be repeated as needed, or as indicated by ADA standards of practice. – which can cause incontinence. – which can cause mineral deficiencies because certain minerals are lost in the urine (particularly zinc, chromium, and magnesium). Confusion and hallucinations, which if not promptly treated can lead to coma and death. As age increases, the sense of taste and smell may diminish. Food may lose some of its appeal. Some prescription medications may cause digestive complaints or cause taste changes. Besides appetite changes, social situations can contribute to malnutrition. The loss of a beloved mate can result in depression and a dwindling appetite. Cooking and eating for one just isn’t the same as sharing mealtimes together. Isolation is associated with poor eating habits, and living on a fixed income can dictate the types and amounts of foods available. In some cases, advancing age brings physical limitations that impact the ability to shop for, prepare, and eat meals. Barriers include visual problems, arthritis, ill-fitting dentures, changes in strength and balance, and decreased mobility. As a result, many seniors are nutritionally compromised. Eat 5-6 small meals per day. Distribute carbohydrate foods evenly throughout the day to improve glycemia. Choose fruit instead of fruit juice. Juice tends to exacerbate hyperglycemia. Eat fresh fruit, or buy fruits canned in their own juices or in water, not in syrup. Eat adequate amounts of protein. Frozen vegetables can be used as needed, and they keep well. Share meals with friends or family whenever possible. Make extra and freeze leftovers for future use. Unprocessed potatoes, rice, dried beans, and pastas are cheaper than prepared items. Use foods with stronger flavors and seasonings if the sense of taste has diminished. Focus on using herbs and spices instead of added salt. Increase fiber to treat and prevent constipation. Keep active; it stimulates the appetite. Calorie requirements decrease somewhat as the years pass by, but vitamin and mineral requirements don’t significantly decrease. It’s important to make every bite count. It’s important to choose nutritious and fortified foods and limit junk foods. If a well-balanced diet is consistently obtained, vitamin supplements are not necessary. If a vitamin supplement is indicated, choose one that provides 100 percent of the RDA (recommended daily allowance). The vitamin supplements are in addition to, not in place of, healthful foods. Vitamin B12: decreased stomach acid is to blame for poor B12 absorption. The RDA for seniors is 2.4 micrograms. Vitamin B12 is abundant in animal products (milk, meats, fish, eggs). Calcium: The RDA for seniors is 1200 milligrams per day. Calcium is best found in dairy products such as milk, yogurt, and cheese. Calcium fortified soymilk and tofu are available. Vitamin D: Lack of exposure to the sun, and omitting fortified milk can lead to poor vitamin D levels. The RDA for seniors is 10-15 micrograms per day. Vitamin C: Fruits and vegetables are the best sources of vitamin C. The RDA for female seniors is 75 milligrams; males 90 milligrams. Zinc: Best found in meat, liver, seafood, eggs, and whole grains, the RDA for adult females is 8 milligrams, and males 11 milligrams. Magnesium: Most abundant in nuts and seeds, legumes, and whole grains, the RDA for elderly females is 320 milligrams; males 420 milligrams. Folate: Found in leafy vegetables, legumes, and some fruits, the RDA is 400 micrograms per day. Caution: Exceeding the RDA is not recommended because high intake of certain vitamins and minerals can cause toxicity.